In addition to monetary gifts, the University is delighted to accept many other types of legacy. Have you considered donating any of the following? Stocks and shares and other investments can be donated and it could be the case that there are capital gains tax benefits to them being signed straight over to the University. That makes this type of gift highly tax efficient and very simple to administer. Durham University can be nominated as a recipient of your Self Invested Personal Pension. The gift of property is often valuable and welcomed by the University. If you wish to allow your spouse or loved ones to live in the property but would like it to go to the University when they no longer need to live there, your solicitor will be able to discuss the benefits of making a reversionary legacy gift. Art work, precious books and documents of significant value relevant to our collections can be donated to the University’s Heritage Collections, which include the Library’s Special Collections, the Oriental Museum, the Museum of Archaeology, and the Durham University Modern Art Collection. We have a Gifts Policy which details the circumstances under which we can accept donations to the University Library. Musical instruments and furniture could also be welcome, though sometimes space restrictions and transport need to be considered. Please contact the Legacies Officer to discuss gifts of chattels on 0191 334 6313 or at louise.mclaren@durham.ac.uk. Among the types of gifts the University cannot accept are donations which limit support by discriminating against people who share one or more specific protected characteristics. This includes, amongst others, gender, nationality and religion. Whilst the University appreciates the sentiment of donors wishing to support a specific group close to their hearts, under the Equality Act 2010, these restrictions are unlawful except under certain circumstances. 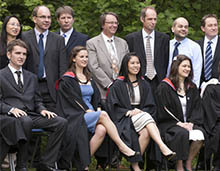 There may be exceptions if the group is under-represented at the University at the time the gift is received. For many areas of our work, it is difficult to predict this. At the time the University is informed of a gift from a deceased estate, if the gift contains any limitation to its application which is unlawful, unfortunately the University might be obliged to turn the gift down. Similarly, if a legacy gift is narrowly restricted to a certain area of the University’s work, there is a risk that the area of work will no longer be active by the time the will comes into effect. If the gift cannot be used for the specific intended purpose and the will contains no guidance in the case that the preferred direction cannot be satisfied, we might not be able to accept the gift. For practical reasons, the University Library's Gifts Policy is strictly applied. If you are concerned at all about a gift which is already in your will or about your plans to include a gift, please speak to a qualified legal professional. Alternatively, you could contact the Legacies Officer on 0191 334 6313 and she will check whether we would be able to accept the gift if it were received today. However, she would not be able to predict a future decision or suggest alternative wording and would ask you to seek independent advice.